THE FINAGON CARDIGAN WAS PUT INTO SMEDLEY’S PERMANENT COLLECTION FOLLOWING THIS COLLABORATION. YOU CAN BUY IT ON THE SMEDLEY SITE. 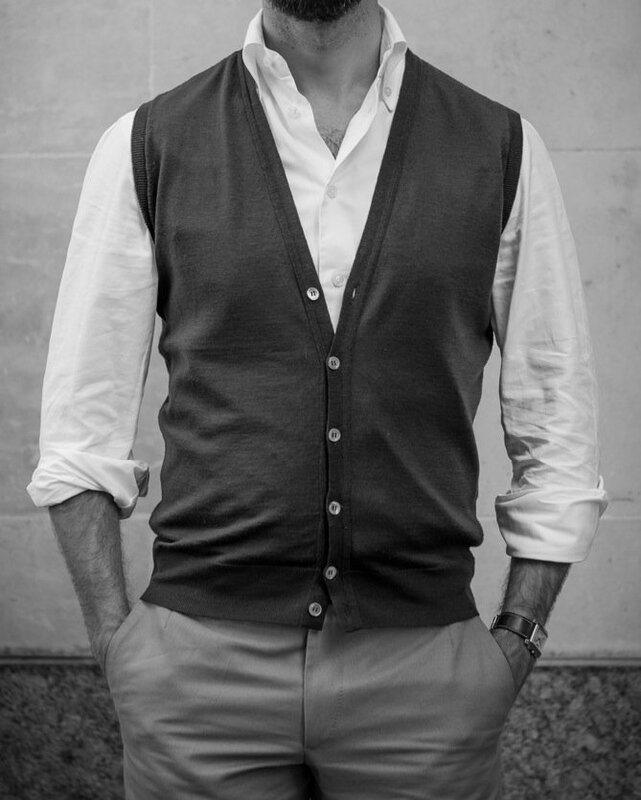 Last year I began working with John Smedley on our next project – the perfect cardigan. It had to be thin enough to wear year-round (and under a jacket). It had to be slim enough to perform the same function, also making it more flattering than the vast majority of cardigans. Finally, and perhaps most importantly, it had to be the right length. Most cardigans are simply too long. That’s the biggest reason why they bag out around the waist – the combination of long length and tight webbing. Guys who wear tailoring often have to undo the bottom three buttons of cardigans to avoid this happening. It’s particularly bad with high-waisted trousers. The result of our work was the Finagon: a slim, sleeveless cardigan knitted in Smedley’s 30-gauge merino. It has a superior fit, works beautifully with tailoring and, length-wise, sits perfectly with both chinos (Incotex straight-cut, below) and high-waisted trousers. But this is different from previous collaborations in one important aspect. You can buy it now, to be shipped instantly, in 14 colours. Previous collaborations such as the Dartmoor were made on a pre-order basis in order to keep down both costs and risk. The success of those projects enabled us to make the leap with Finagon, and make it part of the full A/W 2014 collection. So it is all knitted, sitting in stock and available for you and anyone else to buy. Those 14 colours include classic navy (‘midnight’) and some of my all-time favourites: deep green (‘racing’); a teal colour (‘Egyptian blue’); and dark purple (‘Italian plum’). All will look great with navy suits, chinos and flannels. Deep green is the most versatile; I plan to acquire at least four. As a Permanent Style reader, you can get free shipping on any order – not insignificant, given the majority of Dartmoor sales came from North America and Asia. Simply use the code FINFREEPOST at checkout and get a leap over the general public. That code won’t be around forever – it runs out on September 10 – so get in there now. There are more details of the product on the John Smedley site. If you have any questions, please ask in the comment section below. You can follow the discussion on The perfect cardigan – Permanent Style x Smedley by entering your email address in the box below. You will then receive an email every time a new comment is added. These will also contain a link to a page where you can stop the alerts, and remove all of your related data from the site. Looks great. I’m definitely going to purchase a couple. Hi Simon, will it be stocked in any of their stores? Will the Finagon be available at the Smedley shop in London or is it online only ? It looks great and can’t wait to try it on. Would it be possible to add some garment measurements, eg, actual garment length and chest measurement. I saw that the Smedely website only had chest measurement range indications and I find it much easier to determine fit when the actual garment is measured. The cardigan looks very nice! Away slightly from the Cardi itself, that is a great look in the picture at the top. I would love to see more reccomendations and advice on similar looks – grown up smart casual. Hi Simon, the cardigan looks superb, but may I ask what trousers you are wearing in the photos above? Simon. Slightly off the point but where do you find Incotex Trousers in anything other than their slim fit? They are too slim if you are over 50! Do you know what? I definitely like your innovative mind! Smashing. I see one in Racing Green with my name on it. Very nice Simon, and very nice ‘reveal’ from the previous post. Does this cardigan work for those of us – ahem – developing a slight paunch, or do you really need a flat stomach to wear it well? Any plans for a long-sleeve version? Hi Simon, great collaboration, must invest in one as I tried the JS Gerrard and had to return it for reasons mentioned above. I will need to redouble my cycling regime as I suspect anything other than a washboard stomach is going to look wrong. What shirt are you wearing by the way – a bespoke linen? Is the fit different than the current slim fit waistcoats Gerrard/Wentworth? Any chance it will be offered in XS? It looks fantastic, but Racing Green has already sold out in most sizes. Are there any plans to get any more in stock? Please, please post more over 60s’ fashion ideas. You’re such an inspiration. Do you not rate the drakes ones?? Great idea Simon. I’ve experimented with having pullovers shortened, with limited results. I do find Hackett do some decent shortish cardigans but nothing like this. If you can, please could you post waist measurements along with the length? Great product. Will have to pick up a few! Is the lengt about the same as other JS slim fit products (for example Exeter)? I am bulding up my knitwear wardrobe and have another question for you: What’s your take on v-neck pullovers? Should the v be deep or shallow? And are there materials that work good and bad with v-necks? Sorry, on V-necks: it depends what you will be wearing them with. With a T-shirt should be higher than with a shirt and tie. On the latter, try and find ones that deeper than the average – most give the tie no room. Anonymous is right. They’re out of deep green. Drat. I see, however, that some guy named “SC” has four mediums for sale on eBay at twice the retail price. Yeah, they’re out of deep green because a large number of our initial sales were in that colour. However, there will be new stock in five weeks at the most, and you can reserve these in advance (more details tomorrow). Also bear in mind that this product isn’t going anywhere – it is a permanent part of the John Smedley collection. Hi Simon, thanks for the post. Do you think John Smedley would ever consider putting into its permanent collection your Dartmoor polo? We have talked about it, but not at the moment no. We could do another offer on the site later in the year if there’s enough interest though. Hopefully this is taken in the way its intended. Recently there has been a bit of an explosion of journalists turned subject matter experts in the topics they write about. As one that actually answers peoples query I’d therefore be interested in your views. I read your blog and think its great. I appreciate learning about tailoring in general and the efforts you go to looking into companies etc. Ultimately however you’ve really only first hand experience of dressing yourself and commissioning clothing for yourself. On the flip side tailors, shoe makers etc have experience of making products for a range of different people, shapes, challenges etc. If your collaboration projects with the likes of Smedley are producing much better designed products than they make on their own, what are they doing so wrong as not to create such products themselves without your input? It’s an interesting point, and one that deserves greater exploration at some point. First, on your point about my experience. I’ve obviously tried a very large number of tailors and other artisans, more than almost anyone. But more importantly, tailors actually have very narrow experience. I’ve never met a Savile Row tailor who has been in a Neapolitan tailor’s workroom, for example. Given the popularity of Neapolitan tailoring recently, they often ask to see my Neapolitan, Florentine or French tailoring, and ask me questions about how the making and cutting is done. Second, on collaborations. Nearly all of my collaborations have come about because I have met with a company to write about them, and asked why they don’t have something in their range (usually the thing that would be perfect for me). They reply that they’re not sure there’s a market for it. I say that I think there is, even if it’s small, and why don’t we try an experiment to prove it? That’s what these collaborations are – experiments. The fact they have been so successful so far hopefully shows that my hunches are correct. Big brands don’t usually have the luxury of such test-tube research. They have to press the button on a big production run and take the risk of not selling any of it. Which comes onto the most important point about manufacturers – they are highly conservative. Very little knitwear is slim because men don’t notice when their sweaters are too loose, but they do notice when they are too tight. Heel cups are low on shoes for the same reason, and so on. This is a capital-intensive business and it’s hard to take risks. Finally, this segues into a point about the tailoring community. It seems significant to us, but for a large manufacturer it’s tiny. It is never worth their while investigating this customer segment and finding out exactly what they want. That’s one way I can be helpful. Many thanks for a comprehensive reply. Its absolutely your breadth of experience which makes your blog and opinions very interesting to read. On your comment of “big brands”, are you referring to the likes of Smedley or more referring to high street brands? Perhaps I underestimate the scale of Smedley. I know the alleged quote of Henry Ford about not doing customer research because if he’d asked they’d have said a faster carriage rather than a car but it does sound as if some of these companies are somewhat stuck in a rut if they arent proactively engaging with customers/usergroups etc to innovate products. Similarly market trends, competitor analysis etc. If the trend is for Neapolitan tailoring then they should really be looking into this themselves and not being reliant on a “blogger” coming to visit them. Where we talk about tiny companies then its understandable that they probably dont have R&D/ product development teams etc but you mention these are large manufacturers etc and so really they should. 50% of my work is in this area though outside of clothing and whilst its costly to do short runs etc to test products its a lot less expensive than missing a large opportunity by simply sitting on your historic products and stagnating. I’ll get off my soap box now and continue enjoying your blog. I agree on the market research, although interestingly a lot of companies of any size become conservative very quickly – either because of a lack of appetite for risk, or to chase the higher profits of smaller product ranges. It’s only start-ups or the very big (eg Ralph Lauren) that tend to introduce this creativity into the market. I am a product manager myself as a day job (at a publishing company) and even with the increased move towards lean product development, many of the fashion companies are getting left behind. On the Neapolitan point – it’s not that tailors don’t want to offer Neapolitan tailoring, but that they can’t do it. I even tried to help one Savile Row tailor that wanted to set up a workshop in Naples to make garments of that sort. In the end it didn’t work because it would be too expensive flying fittings back and forth. I have a question about lapel gape. I have a build almost exactly like Antonio Bracciani that you once described and on quite a lot of jackets I try in the stores I get lapel gape effect (collapsing of fabric along the lapel roll line). It seems to be less noticeable on jacket that has waist jacket button little above the waist than on jackets with higher button positioning. My tailor sad this cant be fixed and its better not to buy the jacket. Is this true? Is going bespoke the only way to eliminate this? Are high button jackets current fashion (I say this after trying Gucci and Canali jackets and they have high button placement)? What is your take on Mr Flusser statement (taken from his book): waist button 1/2 inch above waist (to me it makes sense). Another run of the Dartmoor would be fantastic. Not sure if you remember but I contacted you about other makes since I missed the last Dartmoor run. In that time, I have tried a number of different makes–LP, Doriani, Zanone–and none of them are right. I would definitely love to see you bring back a run of navy as I think it would be most versatile, but racing green, burgundy or pretty much any other classic color would be lovely. Cheers. Thank you again for creating new product as well as initiating more shopping with outstanding men’s apparel entities. I first bought sweaters from Smedley after your joint Dartmoor creation. Now, I have gone back to them, thanks to you, as their new colors with a variety of products are just terrific. I have already made a purchase and shall make more once I try one on for size. Equally of value, I have sent them an email expressing my appreciation for your efforts for both buyers and sellers in this market!!! I think I prefer a long sleved cardigan even though I can see the idea of a sleeveless one i.e under a jacket. Have You ever considered a JS shawl-collar sweater for Your next collabation with them – Something to wear at the weekends perhaps with a shirt and knitted tie. The ones I can find is rater chunky – I would like one in the same wool as the dartmoor. Or do You know any knitted there is as described? Frank, I got one from Cordings a couple of years ago which is not too chunky. I don’t know if they still offer them, but it may suit? Hi Simon – where is the white shirt from in the image? Button down but good collar! I’m told by the (excellent) Smedley customer service people that the actual chest measurement (width under the armpit) of M is approx 50cm, L is 55cm, and XL is 60cm. This is much more useful data than the silly sizing “guide” on the website. That said, I’ve always found Smedley’s website and customer service to be excellent. If you have any questions, they do have a live operator on their website to assist you in “real time”. I just tried the free postage code and checked with John Smedley. They thought the code/offer was only valid with the Racing Green colour, is that correct? I am going for (yet another thing in..!) Midnight. I have a Zanone waistcoat that looks similar so it will be interesting to compare. I have, however, been a fan of the JS 30 gauge merino wool for many years. Many thanks for working with JS on the Finagon. No, that is definitely wrong. The code is applicable on any colour on the site. And if you are pre-ordering (because something is out of stock) it is now available on the four colours I mentioned. I will contact Smedley now to make sure all staff are aware of this. All worked fine, just had to log in to my account first. Many thanks – a Finagon in Midnight is on its way! Im just wondering about the shirt you wear on this picture, what is the material called? It looks very god and casual. It’s a basic, mid-weight twill from Thomas Mason. I think there’s more in the cut and construction (from Luca Avitabile) than anything else, but I’d still recommend the cloth. Simon, I really like the cardigan look and am partial to the Smedley Bryn model. When wearing a collared shirt,with or without a tie, underneath the cardigan should the collar be inside or outside the cardigan or is just a matter of personal preference? will the Finagon cardigan come back in F/W 16? The Finagon is available now on the John Smedley site. It was a design I did for them, and it was so successful they put it into the permanent collection. Excellent- thanks so much Simon! I am small and moderately slim. I would consider the Finagon or the Drake waistcoat in lambswool to go under jacket made of tweed. Which would you advise? 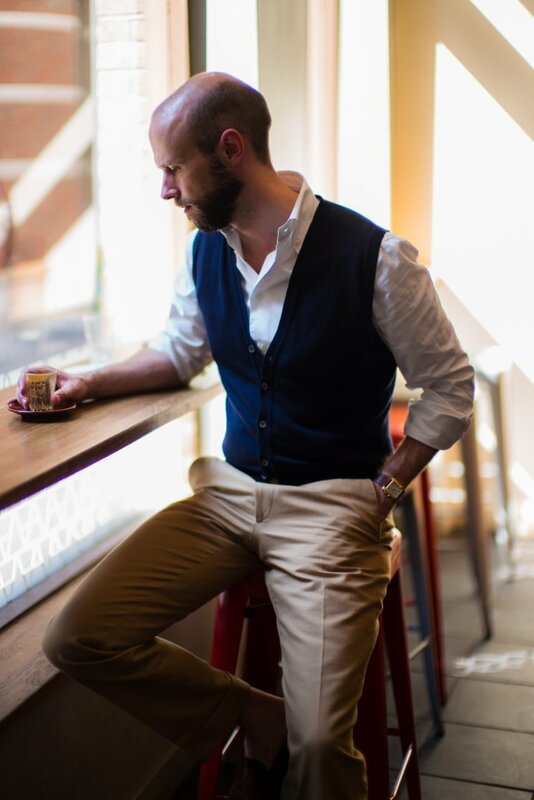 have you tried the Drake waistcoat? Is camel softer than lambswool? The Drake’s waistcoat is not slim, and a little long. I would recommend the Finagon. Any non-Smedley slim sleeveless cardigans you can recommend? Thanks. I think the Shetland ones may be too thick to wear under a jacket. I’d normally go with a Smedley easy fit, which fits slim on me, but they look to be phasing out this fit in favour of the standard fit. I notice the Huntswood at Smedley’s, as of this writing, closely resembles the Finagon. I did find one page that used the phrase, “replacing the Finagon, the Hunstwood…” Do you have any idea if the Finagon lives on with a new name? Hi, Simon. Have just checked the John Smedley website, I cannot see the Finagon, have they stopped making it or have they changed the name? If they have stopped it, which one is more like the Finagon? Are there any out there you can recommend, Simon? How about the Flexwool gilets from Zanone? I have a navy one and other than the larger buttons it is a similar fit to my Finagon. I’m a size 48 in the gilet (50 in the other knitwear) and a M in John Smedley.